This week's Tuesdays with Dorie (TWD) recipe was chosen by Leslie of Lethally Delicious: Tarte Fine. I loved baked apples.... apple pie, apple crumble, apple tarts,... you name it, I love it! So I was thrilled when I saw that Leslie had chosen this recipe! I love how quick and easy this one is! 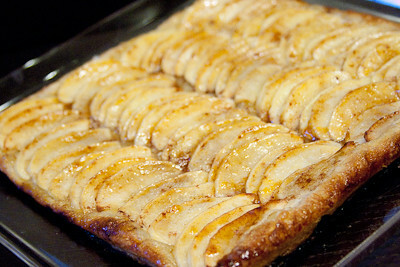 Seriously... just thaw some store bought puff pastry and then throw some sliced apples on top and you're done! Well, there are a few more steps in between, but really, you can make this in no time! I've already made it twice in one week, and the lengthiest step involved is peeling and slicing the apples. The second time I made this tarte, I decided to cut back on the sugar and butter a little bit, but I still didn't make the healthiest option Dorie gives (in the original recipe). I did not put any pieces of butter on the bottom layer, and I added much less sugar and melted butter on top (exact quantities noted below). Honestly, the tarte still tasted just as great and I could not tell the difference... so, when I make this again (and I definitely will! ), I will go with the middle-of-the road option. Thanks Leslie, for hosting this week. If you would like the recipe, you can find it here. 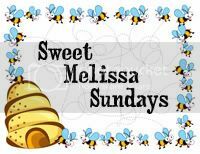 Make sure you check out the TWD Blogroll, to see how everyone else enjoyed this fall treat! As a reminder, if you'd like to meet Dorie during her current book tour, see if she will be visiting your city here. If you'd like to join us at her cooking class here in Dallas on October 24th, sign up here. - If you are using Pepperidge Farm Puff Pastry, then no need to roll out the dough... it already comes premade in the perfect size for this tarte. So just thaw it and then unfold it directly onto your baking sheet. - Before arranging the apple layer on the puff pastry, I sprinkled 1 tablespoon of sugar as well as a generous sprinkling of cinnamon (sorry, I didn't measure it out, just eyeballed it) on top (I omitted the extra butter Dorie recommends in the Playing Around section the second time I made this and still loved it). - My tarte was done a few minutes early. I definitely had to cover the edges with some foil to prevent it from burning, in order to get my apples lightly browned. That's a stunning tart! I also wondered about adding cinnamon but decided to stick to the recipe. And I totally agree that you can live without the butter under the apples and less butter on top. I'm so glad you enjoyed this so much you made it twice. Thanks for baking with me this week! Nothing beats an easy peasy dessert! Your tart looks absolutely lovely. I took some classes where the chef who cooks a lot of French food, made an apple galette and didn't use cinnamon either, which I thought was strange, until I tasted it and it was so good without. (I like both ways), but I think it is a French thing. Great looking tart. So simple and easy and such an elegant result. Jaime, this is a great post! love your tips!!! I need to buy puff pastry for another recipe so I might as well buy a little more and make this! ;) Thanks! this looks delicious! i've been seeing so many apple dessert recipes around lately, and its so hard to choose which ones to make! I've been seeing the tart...and those sugar cookies below...on a lot of blogs. Yours are both particularly pretty though. Apples without cinnamon is like coffee with cream and sugar. Not very interesting. Pretty tart. 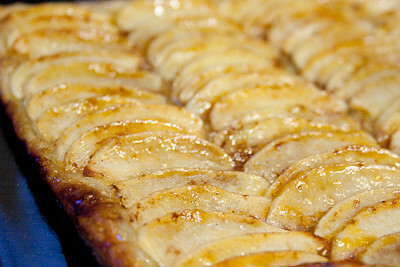 The apples are so well arranged, the tarte looks so pretty!